Media rooms and home theaters are quickly becoming a staple in our ideas of everything a dream home has to offer. 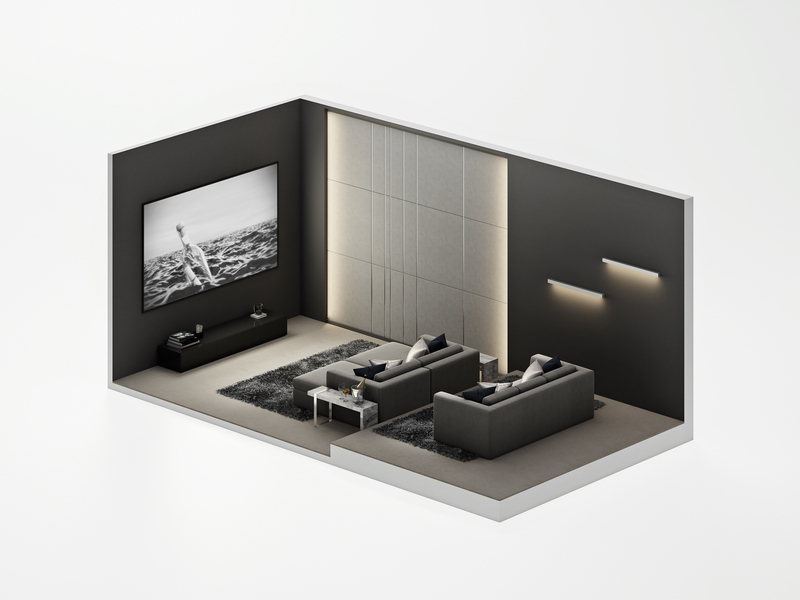 Once reserved for movie-lovers alone, today’s media rooms center around a social experience. 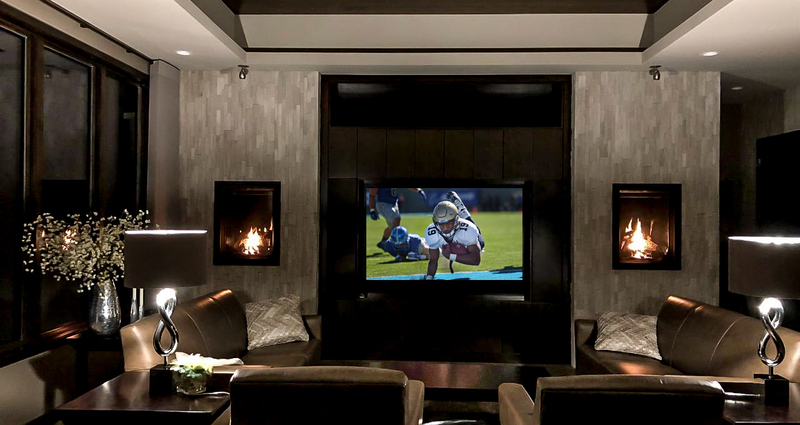 Catch the big game, watch movies or binge on your favorite Netflix series with family and friends in your very own custom space tailored for viewing, sound and a lot of fun. The accessibility of technology and building materials has not only made these entertaining rooms a dream; they’ve made them a reality. For many, the process of putting these in a new construction home has become standard and affordable. Dietrich Homes has been fortunate to work for many folks who have made their movie-binging-dream-rooms come true. Our experiences have taught and showed us the keys to media-room-success including design, placement, color, lighting and more. We’re going to share it all with you, because for us, excellence should be standard. We’ve listed our top 5 items custom home builders, designers and owners are looking for and implementing in today’s media room. We hope they help you dream and scheme to make yours the absolute perfect it can be. Comfortable seating is key. Along with choosing furniture you could sit in for hours, you should make sure everyone in the room has a clear line of sight to the screen. Use neutral colors in your color palette. It will allow the screen to pop and help your friends/family feel relaxed and truly, at home. You and your guests will love having snacks and cold drinks! Think of the things you’ll need to accommodate them such as fridges, storage and surfaces to set them so they’re always only an arm’s reach away! Use up or down-lighting in your home theater or media for effect and to provide soft lighting. Think of everything that will happen in your home theater both on and off the screen. Consider storage for games, devices, and everything else your friends and family will want to have close! Comfortable seating is a must in a media room, and the design for this starts at the build. There are many different types of seating configurations that must be considered for the ultimate viewing experience. Viewing platforms make sure everyone has the perfect line-of-sight to the screen and allow for more people to watch at the same time (after all, the more the merrier for those big games!). Platforms can be wired for sound and vibration to create an enhanced experience. Consider using theater loungers like these from SeatUp on a platform to give the space even more of a cinema feel. Sectional sofas are a great option for soft seating. They are great for socialization and hold a maximum amount of people. Allow space for these in your home plan for good flow throughout the room. Comfortable seating enhances your media room experience. Gone are the days of dark cave-like media rooms as designers are incorporating lighter shades to bring life and vibrancy to these social areas. 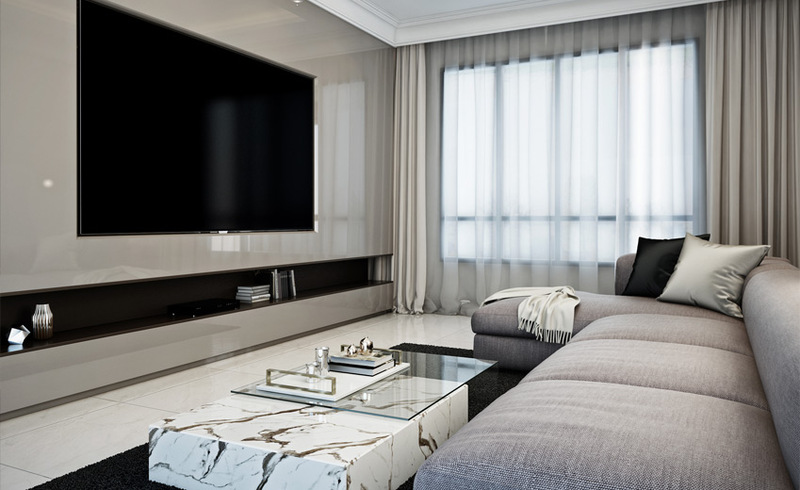 Keep the space neutral to allow that newest episode of Game of Thrones or your next family-movie-night film to shine. Make sure to add signature color to the area with floor pillows, throws or theater-inspired artwork. You can even consider a funky wallpaper that brings charm to the room and elevates the experience. This is the room to stand out; encourage fun; and immerse people in an experience! Patterned wallpaper brings a dramatic feel to this media room. When it comes to color, we lean on our go-to girl, Heather Sagvold, Dietrich Homes’ Design Consultant. “For a dedicated theater room, I like Sherwin-Williams SW 7674 Peppercorn for a gray color, SW 7615 Sea Serpent for a blue, and SW 7505 Manor House for a brown color. 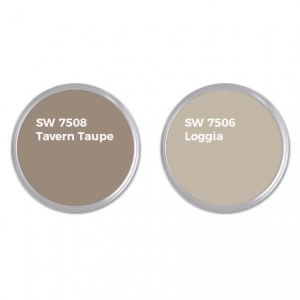 I like to use flat paint in the same color on the walls and ceilings in these spaces to create a true theater feeling experience” says Heather. You can’t accomplish the true feeling of being at the movies without popcorn and Sunday night football is not complete without a plateful of wings and cold glasses of beer! Food and beverage are part of the overall media room experience, so keep this in mind when discussing plans with your new home builder or as you plan your remodel. Do you need a lot of freezer space? If you’re the family that stocks up on frozen pizzas or always needs ice-on-hand for a cold drink, you may need more than you think! What will you be chilling? Will you need a separate wine fridge? You don’t want to run into the situation of completing your media room only to realize your entire fridge is full of wine without room for anything else to chill to perfection. Don’t forget about glassware! This takes up space and proper storage is a must. Be sure to work this into your new home build. Everyone loves a beautiful window that brings in stunning, bright sunlight! As long as it doesn’t wash out the screen during the big game, of course! Talk with your home builder and designer about proper window coverings for the room. Room darkening shades provide a blackout experience when you need it, and retract to let the daylight in when you don’t. They even make some super-cool blackout shades that can be up, down or in between with the simple touch of a button. Additionally, your window coverings are going to be more than light-blocking devices; they are going to be soundproofing! Consider choosing window coverings that span an entire wall and are made heavy fabric. Not only will they look great and block out the light, but they are also a great device for absorbing sounds and reducing echoes. The lighting you choose for the space also can set the stage for the overall experience. Creative lighting options include Philips Hue lightbulbs that allow you to change lighting colors, as well as intensity in seconds through the use of an app. Instead of sconces, consider up-lighting on walls for a modern approach. Ask yourself, what other activities you and your circle like to do. For example, if you’re a board game playing group, the board games will follow you to your media room. Plan for this, embrace this, and most of all have fun with this. Or maybe your friends and family like nothing more than a good night of karaoke. Consider a retractable screen to make a stage of the front of your room or consider a small screen at the rear of your room to display the words of your karaoke hits! Your new home builder will come up with creative solutions to customize your space to best fit your lifestyle. Media rooms are designed for fun and fun to design. Kick back, relax and enjoy the show! Want more? Sign up for our style guides, design tips, and photos of our home remodel and construction projects.